We experienced a decidedly mixed bag on a recent visit to Anmol. We were pleased with the coconut naan ($3.75 and a special that day), and the mango chicken ($7.95). We also liked that we could order any dish with mild, medium, or hot spice levels. And the small bowl of cinnamon-laced rice pudding at the end of the meal was a nice touch (gratis). But the décor is stale, there were too few shrimp in the shrimp curry for the $7.95 price tag, and while the $9.95 chicken masala dosa was huge, it was dry and somewhat flavorless. 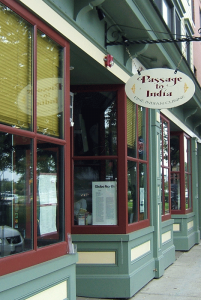 With so few Indian restaurants on the North Shore, we hesitate to disparage this one, especially since it’s not bad, just average. Still, Passage to India is only one town further south, and every meal we’ve had there was much more enjoyable. 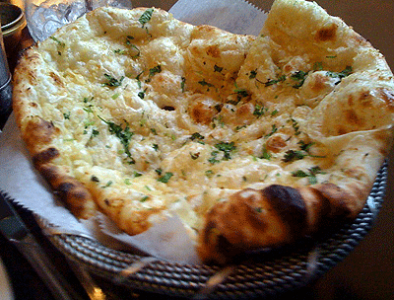 We’re also curious to know if perhaps some of Anmol’s dishes are better than others. If you’ve enjoyed a meal there, please let us know about it in the comments. After returning from a week’s vacation and a long drive, there was no way we were interested in actually cooking dinner, let alone something exotic, but the idea of Indian food had been kicked around. 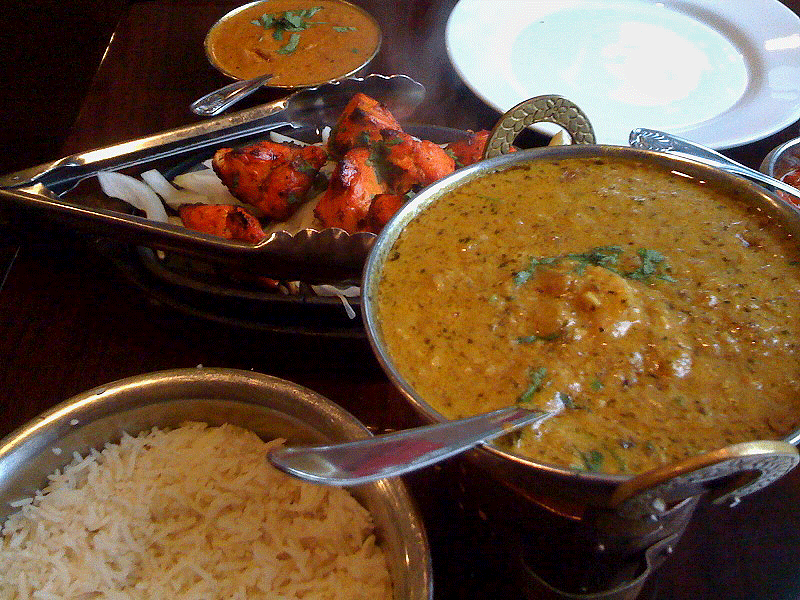 Before long, our curry cravings had us heading in the direction of Passage to India. Tucked into a row of storefronts on Washington Street in Salem, Passage is one of five sister restaurants, including one by the same name in Porter Square, Cambridge. Five locations smacks of a chain, something we would generally steer clear of, but several friends had recommended the eatery. Upon entering, it was impossible not to notice both the fully stocked bar and the fact that the place smelled divine. 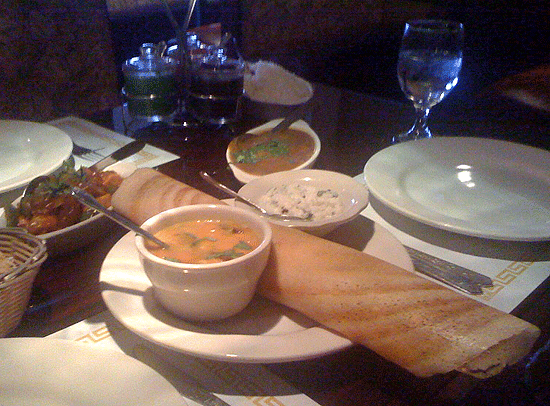 We were seated immediately by courteous and friendly staff and left to peruse the good-sized menu featuring standard options as well as nightly specials, Southern Indian dishes (we love dosas), and seafood specialties not commonly seen in Indian restaurants. We started with cocktails ($8-$9), which were well poured and generous, and ordered the fish pakora, partly because it seemed like a novelty, and the vegetable samosas. The pakora ($7) was haddock, so it had a fish-and-chips feel, but was light and served with marvelous mint chutney. The veggie samosas ($3.25) were well beyond standard: very fresh and crispy with a savory and slightly garlicky filling. When taking our order, not only did our server ask what level of spice we wanted, he used one of the chutneys on the table as an example, so we could understand just how hot “hot” really was, which was quite helpful. For one main dish we opted for the tandoori chicken tikka ($13), which was standard tandoori style chicken, served sizzling fajita style with a tikka sauce on the side. The meat was tender and nicely grilled, and the combination was tasty. Our second entrée, goa shrimp curry ($15), was fabulous in the extreme. It was a yellow curry base with ground coconut, but a complex blend of spices tamed any sweetness and created a rich hot and savory sauce we couldn’t get enough of. By the time we left, every table was full, and it’s easy to see why: terrific food, reasonable prices, and great service. The next time your curry craving sends you on a trip, consider booking this Passage.